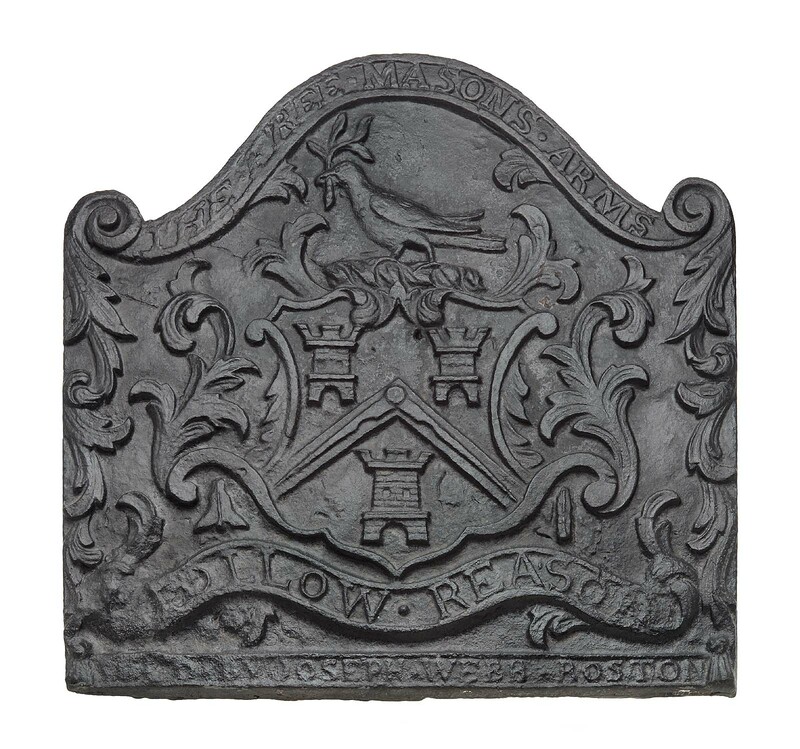 Cast-iron fireback consisting of a panel with an arched top and scrolled ears. Decorated with reliefs, foliate borders at the sides, and in the center with a coat of arms consisting of a shield, three castles separated by a chevron with an open compass, and with crest of a bird with a leafed banch in its beak, all elaborated with foliage. Motto along arched crest; motto in scroll below arms; maker’s name along bottom. Firebacks, made of durable cast iron, protected the rear, brick wall of the fireplace from flames and heat. Firebacks often were embellished in the latest styles or with a family crest. Here, the florid, Rococo-style border of C-scrolls and acanthus leaves is closely related to furniture and architectural decoration; the same woodcarvers who decorated high chests and chairs often carved the wooden molds used to create firebacks. This example bears the arms of the Grand Lodge of the Freemasons in Massachusetts. Joseph Webb was a Freemason, as was Paul Revere, who engraved Webb’s trade card. In a banderole below the shield: "FOLLOW REASON" with pellet between. Along the crest: 'THE FREE MASONS ARMS" with pellets between. Along the bottom: "SOLD BY JOSEPH WEBB BOSTON" with pellets between words. Early history unknown. Consigned to Bourne's auction, November 27, 1982, lot 540; purchased at that auction by John Walton, Inc., a dealer from Jewett City, Connecticut; purchased later that year by the Museum.